After creating a user account in the program and before starting the lessons you will have to complete some tasks first. There are Access Level, Fingers and Posture tasks. 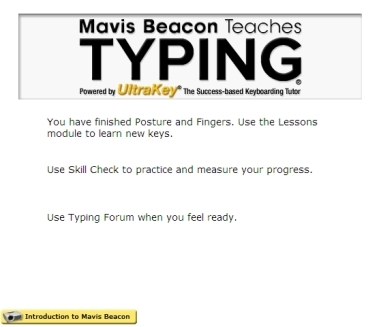 After completing the Access Level you will see similar information on your typing skills as shown below. 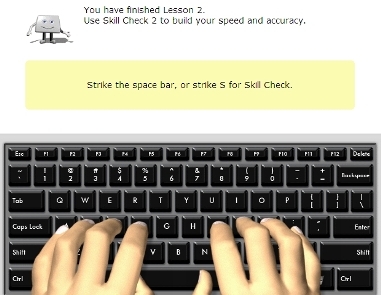 After completing the Posture and Finger tasks you will see the following message. 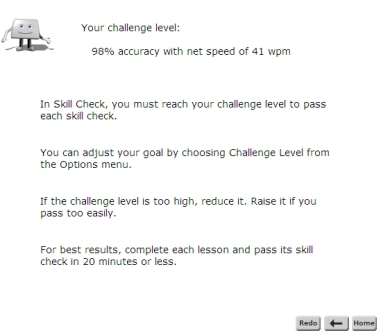 As you work through the lessons you will be provided with Skill Check to monitor your progress. In order to move on, you must first do the skill check. Either strike S for Skill Check or click on the Skill Check box in the upper right corner. You would see this image below when the program believes you are ready for a skill check. To move onto the next level the Skill Check must be passed. You will now be able to move onto the next lesson.